A research team drilling thousands of feet under the Antarctic ice sheet has found new evidence of microbial life there — life forms that live in an environment devoid of sunlight and are not known to exist elsewhere. Why it matters: Subglacial Lake Mercer is only the second subglacial lake in Antarctica to be explored, in an area as vast as twice the continental United States. 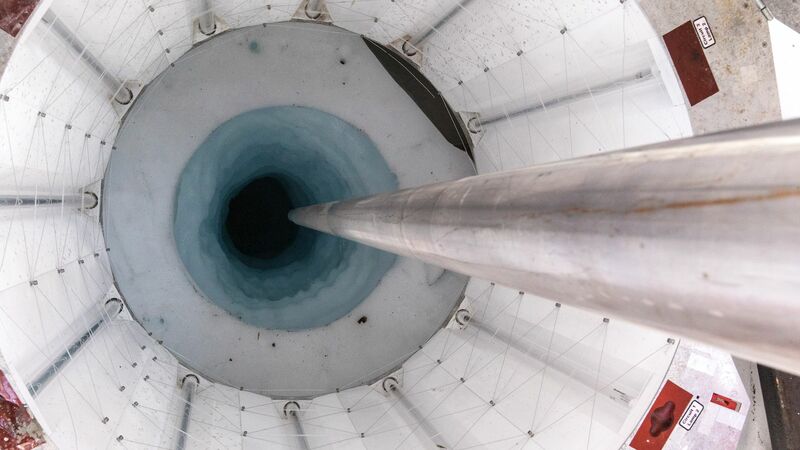 That means scientists have to draw a lot of conclusions from just two holes — but it's the only way to learn about what kind of life exists in the mysterious world of lakes and rivers deep beneath the ice. In addition, researchers think the water moving underneath the ice sheet could further destabilize portions of it, adding to the already quickening pace of sea level rise. Details: Researchers sampled Subglacial Lake Whillans in 2013, finding abundant microbial life. Now we have much more data collected from Subglacial Lake Mercer. During the past two months, a large team of researchers drilled deep beneath the ice pack, about 1,100 meters, or about 3,600 feet, where they broke through to confirm the presence of microbial life in Subglacial Lake Mercer. They collected water samples and drilled sediment cores that should tell scientists more about the history of this region and how the nutrients buried in the sediments are feeding microbial life. According to John Priscu, the project's chief scientist, the ocean once covered the region of Subglacial Lake Mercer about 1 million years ago, and it's thought that nutrients left behind in the sediment are helping to feed microbial life. Fricker discovered Subglacial Lake Mercer by accident in 2007, while using satellite measurements to search for the grounding line of a glacier. She serves on the executive committee of the project, Subglacial Antarctic Lakes Scientific Access (SALSA). Temperature anomalies for Jan. 17–27 from the GFS model. Adapted from the Climate Re-Analyzer, U. Maine. The polar vortex, which typically keeps the coldest air in the Northern Hemisphere effectively locked up in the Arctic, has weakened and split into three pieces. Now, Arctic air is poised to blast across the Canadian border and into the Midwest and East Coast, along with a major winter storm. Why it matters: A coast-to-coast storm during the next several days could deposit feet of snow in parts of the West and Northeast, while ushering in the coldest air of the season. This will yield travel headaches and economic impacts — and there are numerous indications that the severe winter weather is just getting started. The big picture: Computer model projections show round after round of below-average temperatures surging into the eastern half of the U.S. from late January through much of February. In addition, Western Europe and parts of Eurasia also look to be colder-than-average during this period. Michael Ventrice, a meteorologist with The Weather Company, told Axios that the period from Jan. 28 through Feb. 5 is likely to be the coldest of the winter from the Midwest to the Ohio Valley and East Coast, but that plenty more cold weather will follow. Scientists are testing new strategies to build better treatments for people with antibiotic-resistant staph infections, Axios' Eileen Drage O'Reilly writes. One strategy aims to boost the power of current antibiotics, and another uses a new biologic to disable the bacteria's toxins that incapacitate the immune system. Background: As of September, there were around 40 antibiotics in the clinical trial pipeline aiming to tackle antimicrobial resistance (AMR), some of which are targeting Staphylococcus aureus, which can cause cause fatal infections like MRSA and pneumonia. The proteins, called centyrins, bind themselves to some of the toxins produced by the bacteria and halt them from blocking the immune system. "This could be considered paradigm-shifting in that it adds a new class of biologics," study author Victor Torres tells Axios. The combination, called V-r8, was found to be a potent combination in mice. According to Stanford News, it killed about 97% of bacteria after 5 hours. Automated rocket building: Relativity Space, which aims to cut costs of rocket production by 3D-printing its spacecraft, just earned a major thumbs up from the Air Force. Young lives saved: The deaths of children under 5 have dropped by more than 50% over the past couple of decades, Melinda and Bill Gates told a press conference Wednesday, Eileen reports. Grim Ebola milestones: The Ebola outbreak in the Democratic Republic of the Congo has now claimed more than 400 lives, with cases surpassing 600. The outbreak shows few signs of slowing. Antarctic ice loss: Antarctica's annual average rate of ice melt has grown sixfold since the 1980s, a new study found. The study found more melting going on in East Antarctica compared to other recent research. Nature vs. nurture: Genetic factors are more of a determinant for many diseases when compared to environmental factors, a major study found, Eileen reports. Macular degeneration trials: Researchers are planning a Phase 2 clinical trial of a stem cell therapy for age-related macular degeneration, which can cause blindness, Sharon Begley reports for STAT. Asteroid impacts: For the past 290 million years, large asteroids have been crashing into Earth more than twice as often as they did in the previous 700 million years, a new study found, according to Seth Borenstein of AP. Gay penguins of Australia: Two male penguins at an aquarium in Sydney are successfully raising a baby. The devotion of Sphen and Magic has managed to break through the noise of a debate over marriage equality in Australia, Nellie Bowles writes for the Times. Rare island wildcat: Threats to the Iriomote wildcat, a critically endangered species that lives on Japan's Iriomote Island in the East China Sea, may soon grow if the island is designated a Word Heritage Site, Rachel Nuwer reports for Hakai Magazine. Japan submitted it for listing in 2017. Saturn's rings are far younger than thought, data from the intrepid Cassini probe show. In fact, the rings are far younger than the planet itself, at between 10 million to 100 million years old, compared to the planet's age of about 4.5 billion years. Why it matters: The new study, published Thursday in the journal Science, takes advantage of data that Cassini gathered during its final stage, prior to its suicidal plunge into Saturn's atmosphere. It may put to rest a debate in the astronomy community over the age and origin of the planet's famous rings. How they did it: The spacecraft was able to sample the area between the planet and its rings, allowing it to weigh the rings using their gravitational pull. The flight path of Cassini was affected by the rings' gravity as it flew between the planet and its rings in September 2017. The gravitational pull then enabled an estimate of the rings' mass, which allowed scientists to provide an age estimate, too. What they found: The data was a surprise to scientists, as it turned out that the rings were affected by powerful winds in Saturn's atmosphere that had gone unaccounted for in their models. “The first time I looked at the data I didn’t believe it, because I trusted our models and it took a while to sink in that there was some effect that changed the gravity field that we had not considered,” said Burkhard Militzer, a professor of Earth and planetary science at the University of California, Berkeley, in a press release. A lower mass means the rings are likely younger and made up more of ice rather than heavier interplanetary debris. Critical data was collected when Cassini performed 22 dives between Saturn's rings and the planet itself, before its fatal dive into Saturn on Sept. 15, 2017. Thanks so much for reading, and I look forward to seeing you again next week.